Student immigrants lobby for legal residency: Train rides and campus protests are among tactics. A bill that could grant green cards is due to come up in Senate. Illegal immigrant students boarded rush-hour Metrolink trains in Santa Ana last week to bring attention to pending legislation that could make them eligible for green cards and put them on the path toward U.S. citizenship. These young adults, brought to the United States by their parents when they were children, tried to explain to commuters why the federal government should give them legal U.S. residency. Without green cards, the students said they could graduate from college but would probably have trouble pursuing professional careers. Frank Nuñez, who has spent 23 of his 24 years in the United States, wore a business suit and boarded the Metrolink train headed to Irvine. "We want to get the word out, and we want people to see us, to see that we aren't what people think illegal immigrants look like," Nuñez said. "A lot of people think of an illegal immigrant as Paco who just crossed the border yesterday and is in front of Home Depot looking for work." Aboard the train, Nuñez approached passengers and said, "Hello, my name is Frank, and I'm an undocumented student," before lobbying for their support of the proposed federal law. Nuñez and other students around California will spend the next several weeks trying to drum up support with more train rides, teach-ins and campus protests promoting the Dream Act, which stands for Development, Relief and Education for Alien Minors. The act is expected to come up for a vote by the full Senate before Nov. 16. Opponents blocked a previous vote on the legislation, denouncing it as a reward for the children of lawbreakers. "For the next two weeks, we will see a lot of activity from immigrant students on college campuses and in high schools and in the community," said Horacio Arroyo, who has coordinated statewide Dream Act initiatives for the Coalition for Humane Immigrant Rights of Los Angeles. "They will range from educating undocumented students to what their rights are, to telling them to call their representatives." In another Metrolink car, Long Beach State student Jessica De Nova made a confession to a fellow passenger. "It's hard for someone to say it," she said to Greg Ebbensgaard, who was heading home from an Irvine manufacturing job. "But I'm an undocumented student. It's important for me to say it because I want you to get an image of what we look like." Ebbensgaard looked at De Nova, who wore a black blazer and had her hair in a stylish bob, and said he wanted to learn more about the Dream Act. "We need people like you," he said. "They always focus on illegal immigrants as criminals. That's what's hurting you guys. They should narrow the laws so they just block criminals from getting in the country." Other students, such as Carlos, who asked that his last name not be published, were not warmly received. He told commuter Mike Bander, 58, of San Juan Capistrano: "I go to college, and it's important to me and other undocumented students who are fighting for their dreams that you support the Dream Act." Bander, a high school teacher in Huntington Park, was not swayed. "I'm not against these kids going to school, but our funds are limited, and there are only so many pieces of the pie," he said. "It's possible that when they go to college, they take a seat from someone who is a citizen." 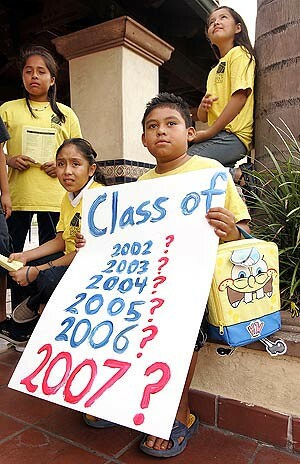 The National Immigration Law Center in Washington estimates that at least 65,000 high school students in the U.S. graduate each year without legal immigration status. Under the Dream Act, immigrants who have been in the country for at least five years, have a high school diploma and meet other requirements could receive conditional legal residency. Over the next six years, they would have to spend two years in college or the military to qualify for permanent legal residency, a step toward citizenship. Rick Oltman, spokesman for Californians for Population Stabilization, opposes the legislation and believes it has little chance of passage. "If we just give the students a break, who will be the next group we will have to give a break to? We're constantly moving the line," Oltman said. "It's unfortunate for these kids . . . but who should feel the discomfort, these kids or American citizens' kids who feel the discomfort when they take away resources and seats in college classrooms?" Students across the state are also asking Gov. Arnold Schwarzenegger to sign the California Dream Act, which would relax some financial aid requirements for undocumented students. The act was approved by the state Legislature on Sept. 11 and remains on the governor's desk. At the Korean Resource Center, a campaign is underway to get Los Angeles-area residents to sign postcards that will be sent to members of Congress, said immigrant rights coordinator Yong Ho Kim. The postcards read: "One in five Koreans are undocumented. Please pass the Dream Act so that young people can go to college and achieve their dreams." In Orange County, a coalition has prepared a resolution for local city councils. A vote on the Dream Act resolution could be taken in the Santa Ana City Council later this month, said James Johnson, community liaison of the Orange County Dream Team, a coalition of students and allies lobbying for the legislation. On Oct. 13, the group will perform a 20-minute play at the Breath of Fire Theater in Santa Ana. The play's title, "Nine Digits Away From My Dream," refers to the need to have a Social Security number to secure a good job. "We're fighting for young people who didn't have any say in their situation," Johnson said. "They did what they were told and came here with their parents. They went to school. They have goals, and they are reaching out for them. We need to help."